If you’d like to improve your basketball defense, force more turnovers, take your opponent out of their offensive rhythm and limit their opportunities for high percentage shots, then you’ll enjoy this article. These 8 critical rules are based on 2-time NBA coach of the year Hubie Brown’s defensive philosophy. They apply to teams of all levels, from youth basketball, to high school, to college and even the pros. After you read these tips, let me know if you agree or disagree by submitting your feedback in the comments box below! When guarding a dangerous offensive player, you’re either going to trap or you’re going to force the dribbler high — but you cannot allow him to turn the corner. If you’re going to force him, force him baseline — do not allow him to get into the lane. Letting a dribbler into the lane opens up the floor and allows that dribbler too many passing and shooting options. Train your players to steer dribblers to the baseline, where the out of bounds line acts as an extra defender, and it’s more difficult to make shots from behind the backboard. You cannot allow a big man to take the ball uncontested from half court. You must cut him off at the circle. He is most likely a weak ball-handler and you should take the opportunity to force a turnover. When you’re defending a post player, never turn your back on him to pick up a cutting player. You should jump out and “hedge” the cutter (ie. stop his cut by putting your body in the way, and prevent him from cutting along the path he wants to go), but keep contact with the post player so you don’t lose him. Never give a player a higher percentage shot than the field goal he’s already taking! For example, if a player is taking a tough fade-away shot from behind the backboard, don’t foul him and give him an easy shot (ie. a free throw instead). Discover 14 proven basketball drills to transform any player into a tenacious lockdown defender! 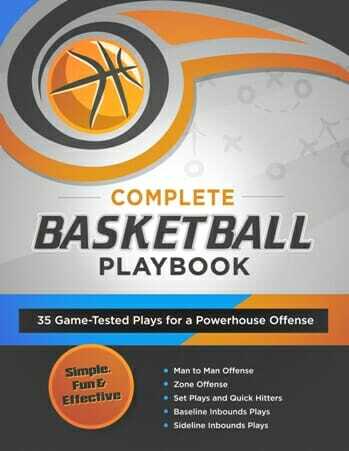 The Individual Defense drillbook is packed with simple practice ideas to install top-notch defensive fundamentals into every player on your team. 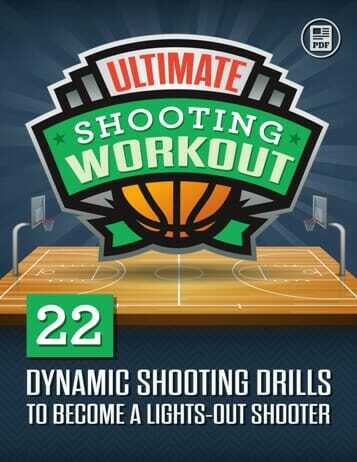 You'll learn how to shut down driving lanes, push post players out of their comfort zone, close out on shooters and force your opponents into taking low percentage shots. Click here to download the drillbook today! Any time the ball goes to the wing and a back screen is set by the center or forward or the point guard, someone must help him out. If you front the low post or gamble for a steal, the other team will likely get a layup. So make sure it’s worth it and you have a high percentage chance to force a turnover or keep the ball out of their best player’s hands. You cannot front a great post-up player unless you also jam the passer. The more pressure there is on the passer, the less chance he has to make an accurate lob pass into the post. If you are fronting the post and don’t jam the passer, a good passer will be able to deliver that lob pass easily, and the post will have an easy layup. Whenever possible, make the ball change direction. This tires out ballhandling guards and disrupts the rhythm of their offense. If you’d like to learn more tips on basketball defense, please visit my basketball defensive drills page, where you’ll discover some brand new, wickedly effective practice ideas and tips for improving your team. 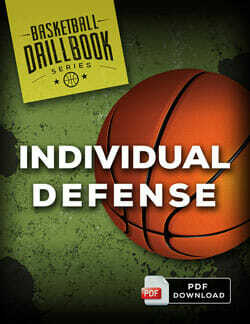 Or if you’re ready to get your team on the fast track, check out the Team Defense and Individual Defense drillbooks. 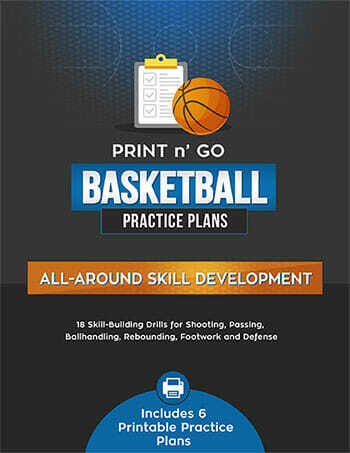 They’re packed with simple, fun and effective drills for basketball defense, and you can download them directly to your computer, print them out, or save them to your mobile device. We always front the post. With good technique we get a lot of steals by ducking the posts arm and stepping back with them when they release to get the pass. We always heat up the ball on the wing since that’s where the inside pass comes from. Disrupt their set plays by forcing the trigger man to dribble . They can’t make the pass they want if they are fighting to keep possession. Force the pg to give up the ball early with hard pressure or a double team. Make their top scorer bring it up court taking them out of the scoring position and making them trigger the play. Put them in unfamiliar positions. I think you’re better fronting the post once the ball goes below the foul on the wing. It becomes a battle of footwork. If you don’t, the post player will get you on the high or low side of your 3/4 and once it goes in you will get scored on or foul. Throwing a lob pass requires much more accuracy and a lot of things have to be perfect on that pass for the offense. And, as it was said, your weak side defender should be able to see it coming and react while his own man is not in much of scoring threat. I love the Defensive principals that Hubie Brown instilled in Basketball despite the fact that it made the game slower and not as exciting to watch in the defensive grinding style prevalent in the NBA of today! My High School Coach followed the Defensive principals taught by then Bucks Assistant Coach Brown in 1972 (maybe even earlier) and my High School won many games because of it! It allowed me to guard Centers and Power Forwards in Prep School and College that were much taller than me at only 6’5″. I even started a few games at Center in College at D2 Powerhouse Florida Southern College (FSC just won the D2 Championship AGAIN in March of 2015). The game may not be as exciting in the defensive grinding style but it is sure effective! When I used to go to 76ers games in 1971-1976 we got free Big Macs if the 76ers scored 125 points but now we get free Big Macs when the 76ers score 100! That is how much the Defensive game has changed Basketball because of Hubie Brown’s defensive Philosophy! It allows good athletes to negate and compete against exceptional athletes! Papa Johns had to lower it’s promotions for pizza discounts from 100 to 90 points last year for the 76ers because the 76ers play a grinding Defensive style lead by Defensive minded Nerlens Noel! Defense is here to stay because of the techniques taught by Coach Hubie Brown! I am a strong advocate of fronting the low post in conjunction with playing hard defense on the passer to make it difficult to make the lob entry pass. Of course, this only works when 1. Your team knows that the low post will be fronted, 2. Weak side knows to help, and 3. the defense on the ball is aggressive. All of this must work in conjunction. Another reason I teach fronting the low post is as a big guard (guards post up too), I loved it when guys would play behind me. I had an up and under, half hook, drop step, open-up-pump fake/drive, ball fake and spin, and finally a fade away. So many options to keep the defender guessing. If you can do this on both blocks with either hand, you will eat defender alive. Now Imagine combining some of these! Trust me, if a player can do this, fronting the low post is the way to go. I also disagree with fronting post players. Yes you want pressure on the passer, but fronting allows weak side help to come over and still trap with basket side pressure. If the only option is to to pass over the top, the weak side defender can come over and set up to take a charge! Even a 3/4 front is sometime taught rather than fully behind. It depends on you teams defensive philosophy! I don’t agree with not fronting the low post. If you front the low post, the other defenders know that the entry pass has to be a lob and they can expect and react to it.If you are pressuring the ball – a lob pass is not an easy entry. Also, it is much too easy for a low post offensive player to seal his defender on a drive and prevent help. 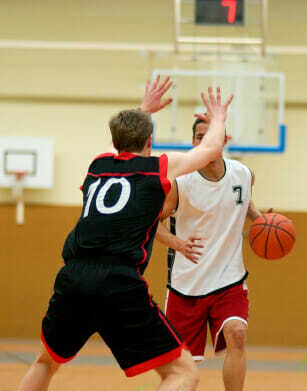 If you are making #1 a top priority then fronting the post makes it much easier to keep the ball out of lane. I am a youth basketball trainer in the netherlands and some of these rules i have learned about. Thanks to Hubie Brown I also understand why they are used and why they are called rulles. And the kids seem to understand it as well. I myself as a player apply the rules when I am playing, once done the correct way, they are very effective. These are some great rules and fundamentals for defense. One thing that needs to be stressed though is defensive communication. If everyone isn’t on the same page and communicating, it wont matter what type of defense you are running. Thanks for the article! Very imortant things to tell your good and bad players. It helped mine a lot.